Welcome to the Palatka Railroad Preservation Society. We began in 1993 as an informal organization of people interested in railroading. 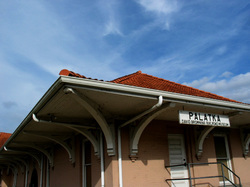 The City of Palatka promoted the establishment of an organization and provided the use of the Palatka Railroad Depot. The historic A.C.L. Union Depot, as it is also known, is listed on the National Register of Historic Places. One 25'X30' room has been set aside for the construction of a model train layout depicting Palatka and surrounding areas during the heyday of rail traffic. The South portion of the depot houses "Railrodeo", created by Irvin P. Saylor. It was billed as the "World's largest mobile HO scale model railroad" when it began touring the East Coast in 1975. Railroad lines that preceded CSX are: Jacksonville, Tampa & Key West; St. Augustine & Palatka; Oklawaha Valley (Ocala Northern); Florida Southern; Georgia, Southern & Florida; Atlantic Coast Line; Florida East Coast; Seaboard Coast Line and Family Lines. Amtrak also leases trackage from CSX and has scheduled stops at the Palatka Depot. There will be some changes to our open house schedule. Please check the calendar to remain updated. Updated Trackside Report click here to see it! St. Johns and Halifax River, main track, 4 miles, $1,200. Palatka and Indian River, main track, 25.17 miles, $1,511.02, side track 1.5 miles, $1,750. Jacksonville, Tampa and Key West, main track 15 miles, $105,000. Side track, .5 miles, $1,750. Florida Southern, main track, 28.79 miles, $143,000, side track, 2.5 miles, $6,250. The museum is open daily while the Ride Solution bus station is open. The museum and model railroad layouts are open on the First Sunday and Third Saturday of each month from 1pm to 4pm. Please see our calendar for more information about happenings!